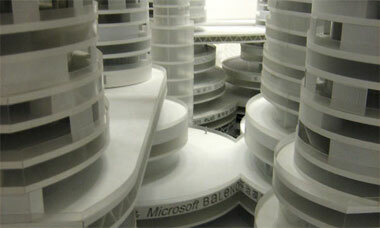 The 2005 installation Beijing Boom Tower (BBT) presents a model showing 6 hectares of the capital in 2020. The design of the block underlines the conflicting desires of the modern metropolis: its boom demand for urban space, and its consequent suffocation. BBT is the product of suburban-feel living at 10 times Manhattan density. 5000 duplex apartments are stacked to form an integrated environment. Full-scale parking, retail and amenities systems are laid on. A privacy gradient acknowledges the increasing reality of a competitive housing market seeking privatisation and exclusivity. BBT presents an extreme architecture of networks, bridges, escalators, highways and towers; a continuous system that reunites the segregated Chinese society within one vertical neighbourhood.